You know how it is at this time of year. Parties and events and all sorts of social obligations, all of which need the right costume. As if there wasn't enough conspicuous consumption at this time of year without having to spend out on party clothes. That's if you can find one in the right colour and size, of course. There are great leaps and bounds being made in the realms of 3-D printing, and some really interesting initiatives that could lead to the dream of completely customisable clothing that you design and print for yourself. For example, Dutch designers The Post-Couture Collective are already offering clothes that can be printed out in sections and clipped together like Lego. If you don't have the wherewithal to do that, Post-Couture can send you the sections in a wide range of fabrics, including one derived from recycled Sprite bottles. The environmental impact of this kind of thinking is profound. It's a zero-waste model: you only print what you need. If your garment is made from recyclable materials, then it almost doesn't matter if it's created for a one-off event. The fabric can go back to raw to be used again. If you're printing it yourself, then there are no transport costs. It's as local as you can get. There are other approaches to the notion of customisable clothing. How about a pair of shoes that can be any colour you want, or feature any design? Shiftwear, a new start-up currently going down the crowd-funding route, fuses fabric into a wearable screen that wraps around the foot. They offer downloadable designs, but with this kind of platform the sky is really the limit. Animated and dynamic content works just as well as static. Think about it. Head off to the Star Wars premiere with your kicks playing Episode 4 highlights. How cool would that be? All of this is a little way away from filtering down to the average consumer, but it's very close to market. Here at The Pier we're all about innovation, and when it comes to alternatives to the Xmas grind for new clothing that you'll only wear once, we're in full support for anything that disrupts the model. Plus, did I mention shoes that could play movies? The life of a refugee is one spent in limbo. Chased from your home, living in a camp or in severely reduced circumstances in a shelter, with little or no way to make a living. It's in our nature to want to help, but charity is not what refugees need. The first thing they would ask for is some kind of normality. A chance to contribute. A chance to work. Raven And Lily are an ethical apparel company that base their whole approach around a desire to let. refugee communities regain a little pride. They are partnered with groups of displaced artisans scattered through nine countries. 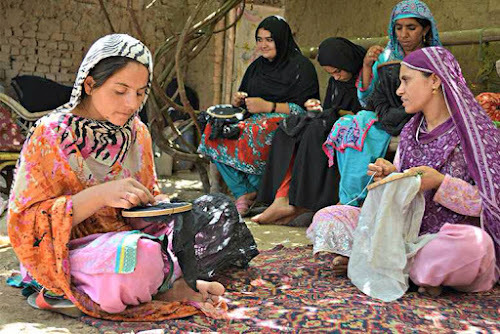 Their latest initiative, the Pakistani Collection, highlights the works of Afghan tribeswomen, all of whom are paid fairly for their skilful work. Raven And Lily founder Kirsten Dickerson explains the thinking behind the handmade clothes of the new line. For our Pakistan collection, our Afghan artisans utilize their incredible embroidery skills, and it also gives them a chance to ensure their children have a good education and can break out of the refugee camp poverty cycle. We also want younger women to value what their mothers and grandmothers have done, while getting an education, so that their cultural and artisan skills do not disappear. We’re partnered with 272 women across eight refugee camps. There’s three different skill sets within those camps, because the women represent various tribal groups from Afghanistan. Each tribal group has different embroidery techniques that represent the region they originally came from. With every design that we create with them, we actually think through designs that would use each one of their embroidery techniques so that we can employ as many of the women as possible, since they’re spread out among all the refugee camps. It's a complex dance, involving a lot of communication and organisational nous to pull off. But the key to Raven And Lily's success is thoughtfulness. From the source material through to the design, every piece is carefully considered, with a clear focus on the ethical implications of every decision. This holistic approach helps Raven And Lily to stand out from the crowd. But we shouldn't forget that the clothes are also beautiful, highlighting the skills of these dedicated artisans. Our View: Raven And Lily are a great example of how to work within an ethical framework while still producing items of great quality and beauty. All power to them. You can find out more and buy items from The Pakistan Collection here. The Christmas break is coming ever closer. Even here at The Pier, the time is near to give all our factory elves a break. It's been a bumper year for us, and we're ready for a chance to recharge the batteries and get our eggnog on. So, if you want any last-minute orders, you'd better get a wiggle on. Our final deliveries will go out this Friday, the 18th December. The machines will start up again with a cheerful groan on Monday 4th January, ready for a busy and successful 2016. But fear not! Our directors, Gerry and Ian, will be checking emails through the holiday period, so don't be afraid to get in touch–even if it is just to wish us a happy Christmas! The View will be dropping into Xmas hibernation at around the same time, but do look out for our Best of 2015 post, which will be arriving at some point between Christmas and the New Year. The perfect opportunity to look back over a fascinating year in ethical fashion and charities. Meanwhile, our Twitter and Facebook feeds will still be open. Please do check them out and give us a follow. Links are in the sidebar. As for 2016, expect our three-a-week post rate to continue, with an increased focus on the Third Sector. And keep your eyes open for our fresh new look... coming soon! There's still a couple of posts to come from me, but let me take this opportunity to thank everyone that follows, reads and comments on The View From The Pier. It's been a busy year down at the Writing Hut, and it's always good to know I'm not on my own down here. 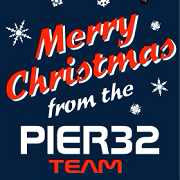 From Gerry, Ian and the rest of the Pier32 Crew–Happy Christmas! Some interesting results are coming out of the International Climate Change Conference (COP21) in Paris, not least from some big names in fast fashion. Let's start with a blunt statement of fact. Climate change is real, and it's causing catastrophic shifts in the global landscape. Flooding in Chennai has displaced thousands of people. The North of England is still struggling with the after-effects of Storm Desmond, which has caused the highest recorded amount of rainfall in some areas in a century, and forced many hundreds of people out of their homes. It's almost absurdly clear that something has to be done. There's the point. The businesses behind that statement are the largest producers of cotton in the world. Now, I know it's a thirsty crop, but even cotton doesn't do well underwater. The joint statement shows the realisation that climate change presents a clear and present danger to the resources and people without which they cannot survive. Let's be clear: the statement issued at COP21 has little to do with altruism. It's about survival. Now, this is a big deal. When some of the biggest names in business come together with government to announce change, then two things become clear. Firstly, that something might actually happen this time. Secondly, that these hard-nosed corporate heads have run the numbers on climate change... and they're terrified about what they can see coming. Time is running out, but announcements on this scale are unprecedented. This is a cross-brand initiative that includes most of the planet's best known apparel names, standing together to demand a real solution to the major issue of modern times. Climate change is an underlying cause of much of the unrest we see today, as arable land and potable water become resources worth fighting over. We'll have to wait and see what form the new agreements and plans take. But for once, we can see political and business needs meeting in the defence of a greater good. And that has to mean something. Doesn't it? You want to shop ethically. As a big fan of The View From The Pier, you know that we urge consumers to think about how they buy, use and re-use their clothes, as active contributors to the ethical fashion scene. But it's tough. Brands launch new initiatives and campaigns all the time. Does a limited-edition run of an eco-conscious range mean that a high street brand can be trusted with your green pounds? Or are there other nasties lurking under the surface: pollution, worker abuse, unsafe or dangerous premises? The thing is, short of doing the research every time you pop out to buy a pair of socks, it's hard to be sure that you're doing the right thing. Which is why a new app currently looking for funding through Kickstarter might just be the answer to your ethical shopping dilemma. Not My Style takes the information you need to make informed decisions on the clothes you buy and presents them in an easy-to-see way, on a device we all carry with us every day: our smartphones. The app gathers assessments from leading industry research and overlays it with a review of consumer-facing transparency. In other words: how easy is it for you to find out from stores how the workers in their supply chains are treated? There's also an opportunity for the brands themselves to contribute to the assessment. Not My Style distills that data into a simple ranking, on a slick, stylish app. You can then make an informed choice about where you want to shop and ensure your style matches your values. 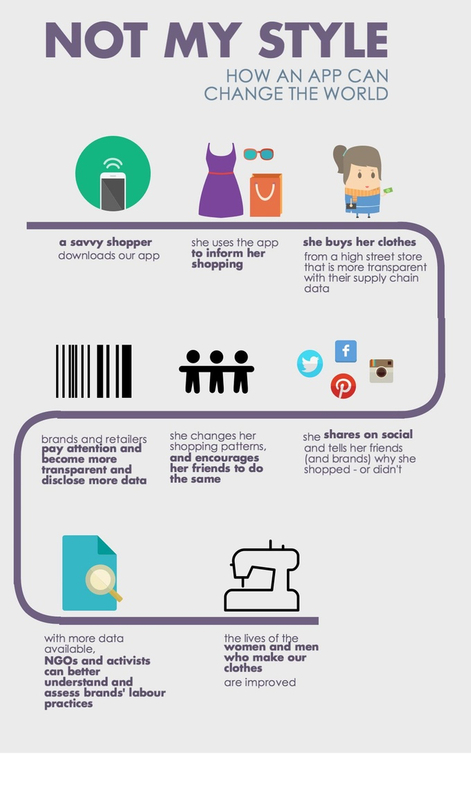 Our mission will only be achieved if thousands of shoppers use our app - that way the brands will have to listen. So our challenge is to build an addictive app that shoppers will want to use and ensure we effectively promote it across the country - and maybe one day the world. We will know we’ve been successful when more brands tell the full story so that savvy shoppers can make informed choices about where to spend their money. We are also making sure we are on sound legal ground, and will rely on the help of the TrustLaw network to access pro bono support to make sure we are giving you the best information we can. Finally, we need to make sure you – and the world – trust our ranking system. Our team already brings a lot of expertise in this field and we’ll be working with industry experts to ensure we build something you can put your faith in. We also hope our users and supporters (you!) will provide us with feedback as we go along. It's an ambitious plan, with room to grow. One of the founder's visions is to use Not My Style as a kind of fashion aggregator, an ethical Asos, if you will. By building that functionality that gives you the information you need when you need (and by using GPS, how close you are to the nearest ethical outlet) the hope is that people power will start to nudge the big brands in the right direction. It's clever, forward-thinking stuff that puts power quite literally in the consumer's pocket. And with a green-to-red light ranking, it couldn't be simpler to use. Our View: brands are often elusive about their record on ethical issues. 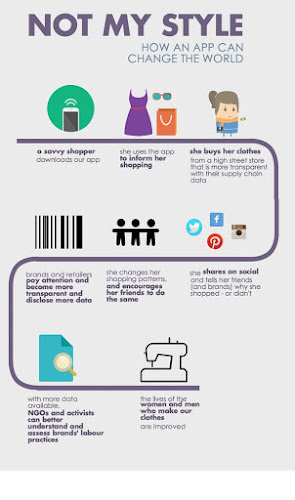 Building transparency into the everyday shopping experience is a very good idea, and we applaud the creators of Not My Style for making something that could well be a game-changer. BREAKING: Good news! With 11 days to go, Not My Style has reached its funding target. There's still time to get in on the ground floor and be part of the community. For more, check out Not My Style's fundraising page.